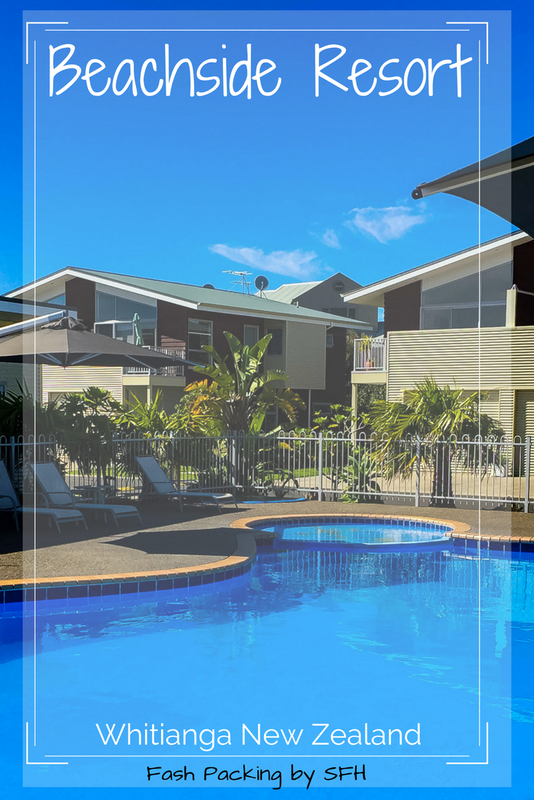 Beachside Resort Whitianga offers contemporary rooms and self catering apartments with wide appeal. Families, couples and groups are all equally well catered for in this small family run resort. We drove our Airport Rentals hire car 2 ½ hours from Auckland to arrive in Whitianga perfectly timed for the 2pm check in. We misread the sign out the front and found ourselves in the wrong reception as there is another resort in the rear. Oops! Apparently it happens all the time so we didn’t feel too bad but don’t make the same mistake, Beachside’s reception is right at the front of the complex. The apartments are arranged over two storeys in a long row with outdoor off street parking close by. Beachside Resort Whitianga was not at capacity during our stay and there were only a handful of other guests in residence which was an unexpected bonus. There is no lift at Beachside so if stairs are an issue for you I would suggest requesting a ground floor room. 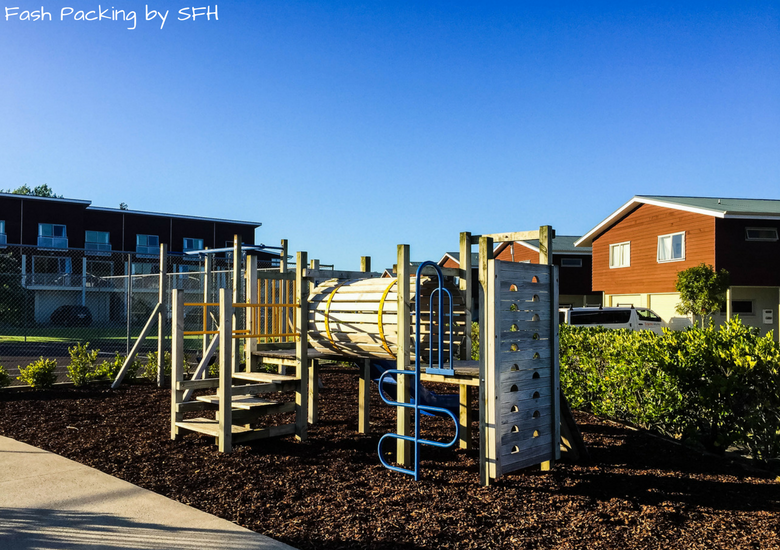 Beachside Resort Whitianga occupies an enviable location only a short walk from Whitianga’s main street and steps from one of New Zealand’s best beaches. 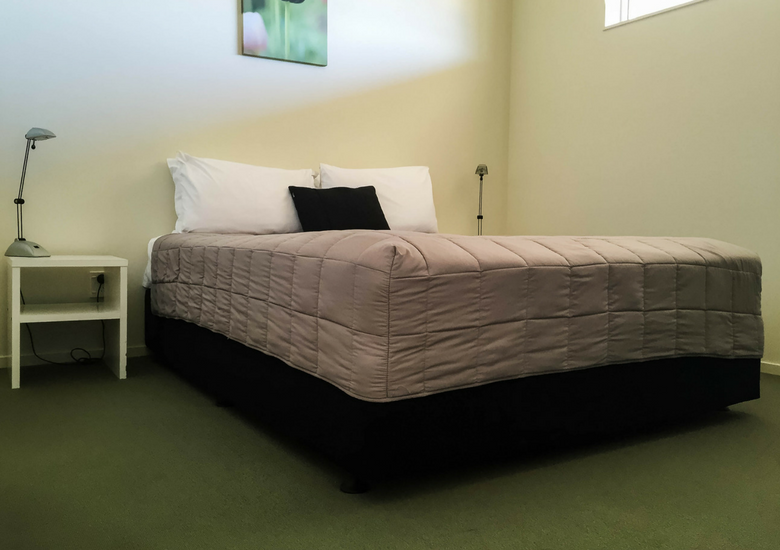 Rooms start at NZD$175 per night and you should book online direct with Beachside Resort for the very best rates. 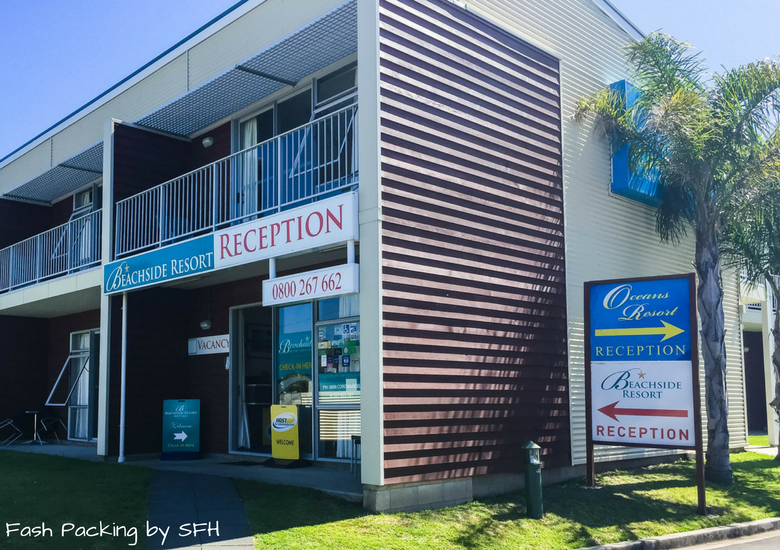 Beachside resort Whitianga offers 5 categories of rooms and we chose the Oceans apartment. We were allocated a room on the second story and because we had a very generous luggage allowance with our Emirates first class ticket we took full advantage and had two large suitcases to lug up the stairs. Lucky I brought the muscle with me (aka The Hubs). 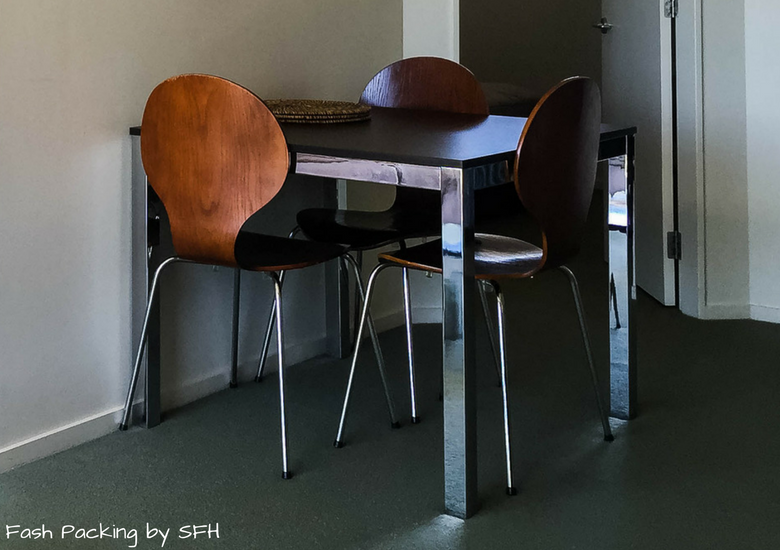 The combined living dining room was a nice size and there is a single bed tucked behind the lounge that was perfect for laying the largest of our suitcases flat for easy access. The Hubs wouldn’t share the compact two seater lounge he made his own so I was relegated to the chair or the dining room which made seeing the TV screen challenging. There was no air conditioning or overhead fans in our unit but the mild spring temperatures meant we didn’t miss it. If you visit in the height of summer you may need to drag out the free standing fan from the bedroom closet. 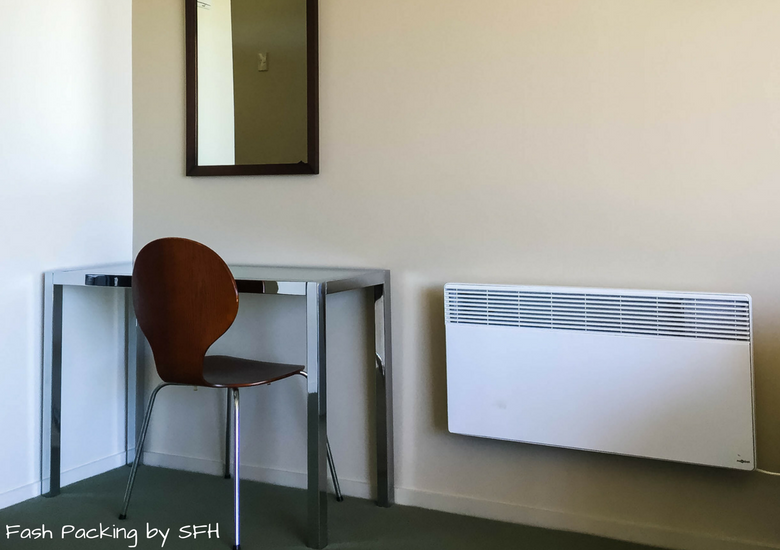 Clearly beating the cold is more of a concern in Whitianga as a wall heater is supplied. 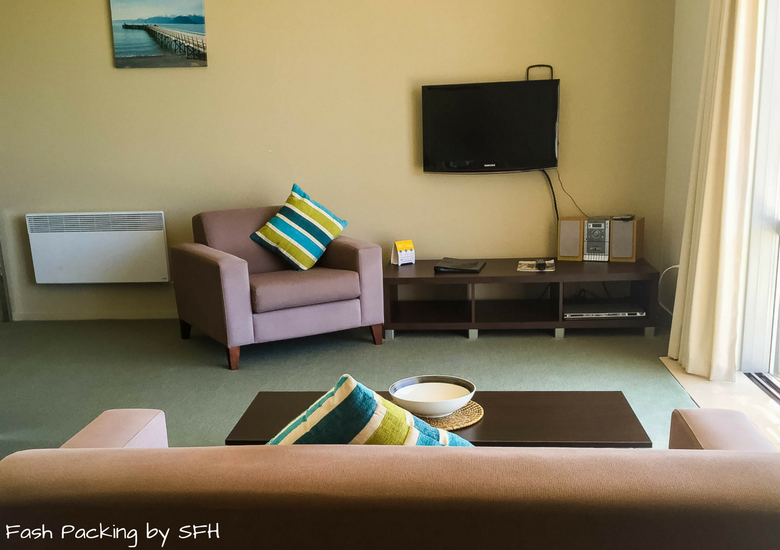 Serviced apartments rarely come with daily servicing but Whitianga Beachside Resort is the exception and this was a very nice surprise. On entry a fully equipped galley kitchen awaits which offers everything you need to whip up a feast. While we chose to dine out, we certainly appreciated the generous sized fridge to keep the beer and wine icy. The compact bedroom houses a queen sized bed and is filled with light from a high-line window that still maintains your privacy. It’s sparsely furnished and lacks a little soul but was immaculately clean. The bedding had clearly been freshly laundered and I love the feeling of sliding between crisp sheets after a hot shower and a long day. The bathroom is ensuite from the main and the door opens outwards into the bedroom which only just clears the bed but we quickly got used to this strange arrangement. 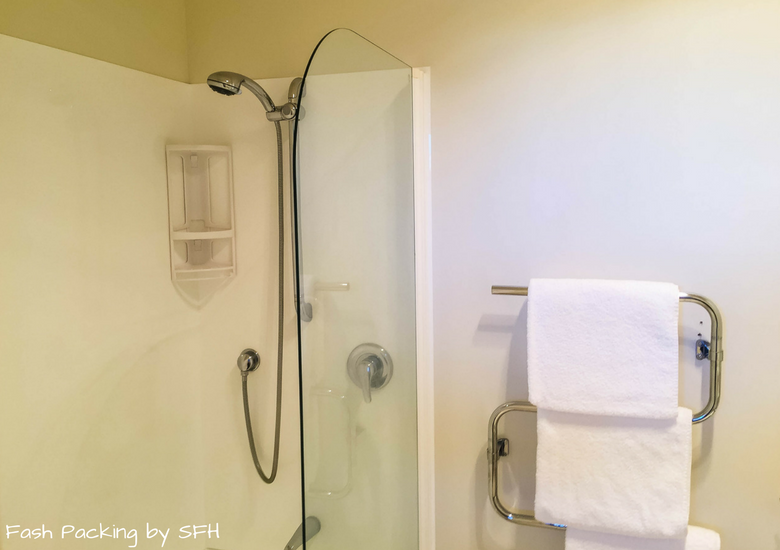 The Hubs is very particular about showers and proclaimed this one ‘awesome’. He enjoyed the great pressure while I appreciated the hand wand to keep my hair out of the water. Basic toiletries are provided if you choose not to bring your own. The toilet paper supplied was very thin and not to my liking but this is a very minor issue. Plenty of towels were supplied on the heated rack which would no doubt be delightful in winter. A narrow balcony runs the full length of the living area and is drenched with afternoon sun. 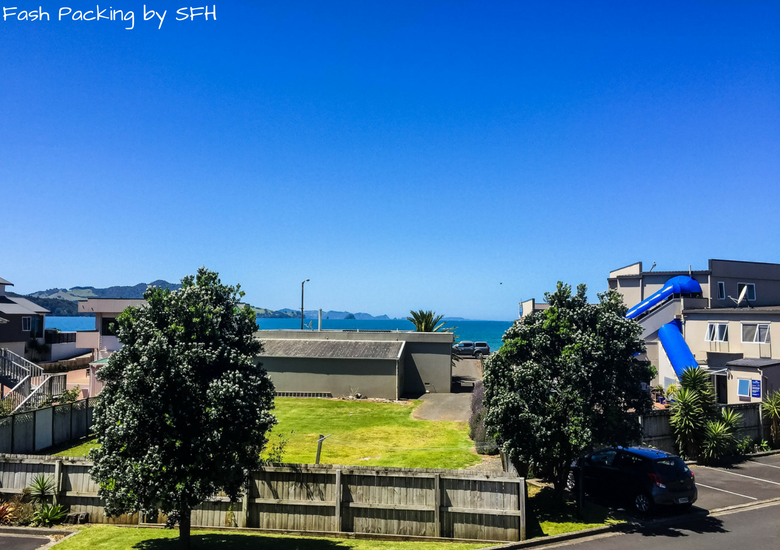 We were lucky to enjoy ocean glimpses across the single row of buildings in front of Beachside Resort Whitianga and at night the sound of crashing waves makes the perfect partner to a chilled glass of NZ Sauv Blanc. 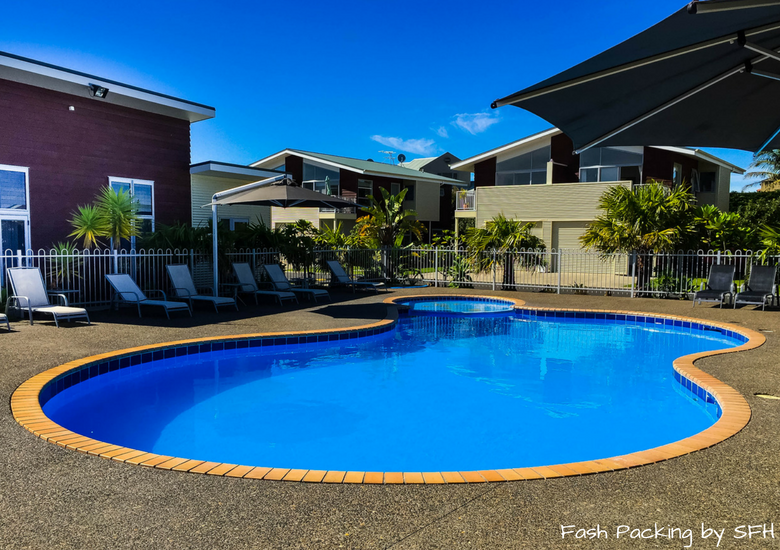 The facilities at Beachside are clustered at the rear of the complex where you will find a heated pool (this is NZ after all! ), a children’s playground and a tennis court. Beach towels are readily available from reception and while we didn’t swim in the pool they did come in handy for our afternoon at Cathedral Cove Kayak Tours. Free and efficient wi-fi is provided and was greatly appreciated by us both. There is even a boat washing area for those that need it! Whitianga itself is a quaint little town with a sleepy feel but has everything you are likely to need. The beach is right across the road and a great place to while away an hour or two. Walk to Frankies pub and try the local brew which The Hubs rated and grab a casual lunch while you are there. There are sufficient restaurants within easy walking distance to ensure you can eat somewhere different every night of the week. We particularly enjoyed our Greek feast at Al Camino and you can’t go wrong with the Tuesday night specials at No. 8. 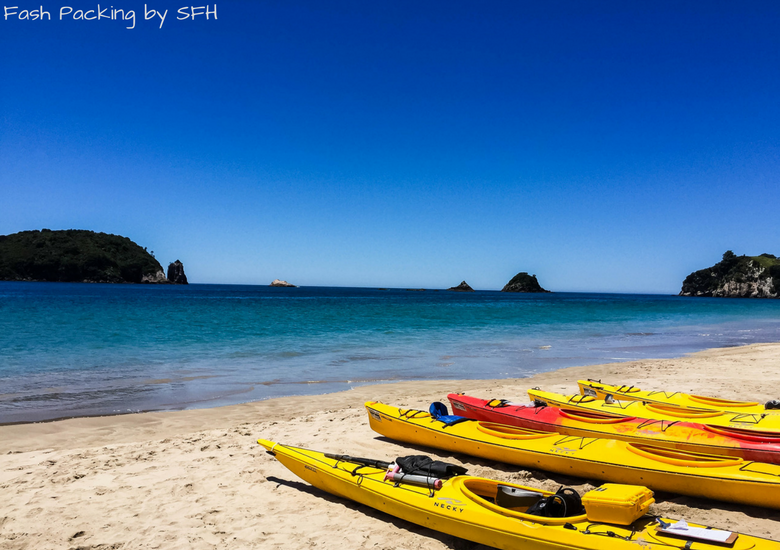 Take the car to Cathedral Cove Kayak Tours for a spectacular afternoon on the water, check out Hot Water Beach, or visit Purangi Estate and Mercury Bay wineries all of which are within a half hour drive. 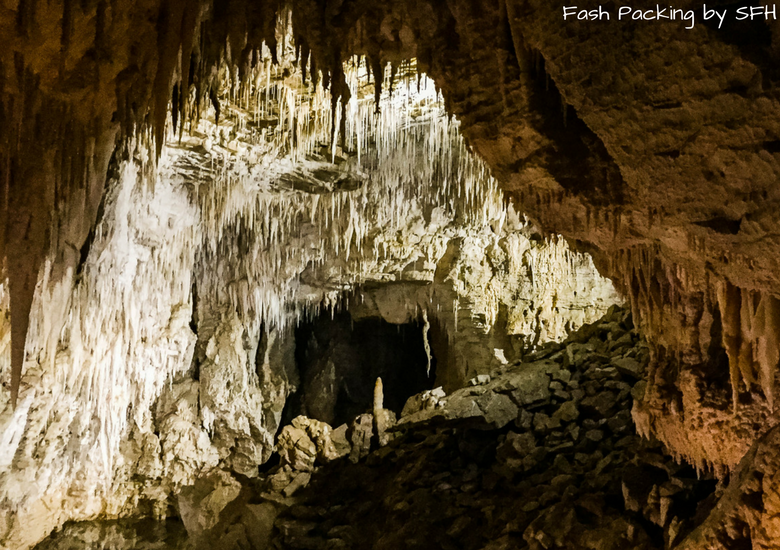 If you fancy exploring further afield, Hells Gate, Te Puia and Skyline Rotorua can all be reached in three hours as can Waitomo Caves. 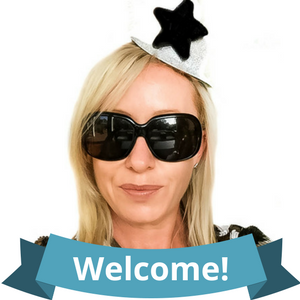 If you are visiting New Zealand for the first time make sure you check out my post on New Zealand essentials, which gives you all the information you need to know before you go and bargain hunters should read all my tips on scoring a bargain flight before booking anything. 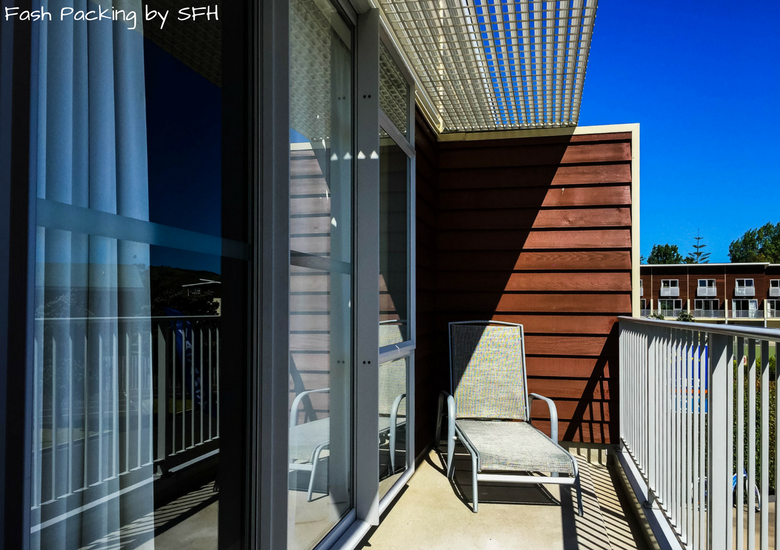 Will you consider the Beachside Resort Whitianga when you are next in New Zealand? I would love to hear you thoughts in the comments below. Disclaimer: I received a discounted rate at the Beachside Resort Whitianga as part of this collaboration. As always, all opinions are my own. Wow! What a lovely place to stumble upon. We love to visit the off the beaten path places and that includes lodging that isn’t a chain hotel. It looks like this one is a winner! Suited is perfect rely for the night Natalie. Beachside has everything we needed and nothing we didn’t ? What a great deal of an accommodation! The lack of elevator is a bummer, especially if you are going to lug around your baggage. But as you said, requesting a ground floor room is an option. It’s a nice little compromise though when you have that gorgeous view! Plus, knowing that it is beachside and the beach is fantastic, I’m in! Oh this looks like a great place to stay. I love the colours in the room and I love a resort that has so many facilities. That beach is so idealistic, would love to visit this lace to unwind! The beach was lovely Katie. So many wonderful places in the Coromandel that you could spend weeks exploring them all ? Neatly explained post and after reading is somewhat considering to visit and I’ll be sure to check on your post “New Zealand Essentials” as a first timer visiting. Mercury Bay wineries, the wine finds you everywhere you go! Beautiful photos. What can I say promise I have a nose for seeking out wine. Hope you make it to New Zealand soon ? Adorned with the basic minimal this resort looks quiet a find to me. Sounds absolutely comfortable. And the nearby landscapes are also so beautiful. 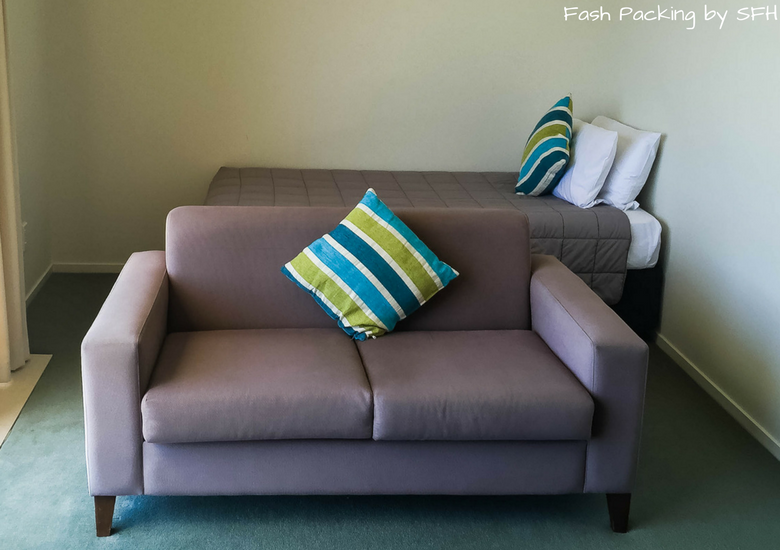 We were glad we chose Beachside Neha as it provides everything we needed for our short stay. Agree Neha! Location is critical ? Never in a million years would I have guess to pronounce Whitianga ‘Fit-ee-enga’! 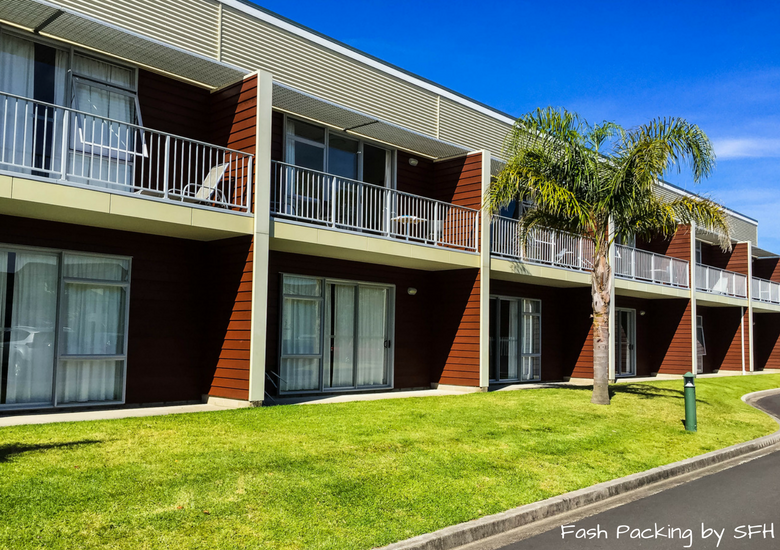 Finding accommodation in small areas can be a bit tricky – looks like Beachside Resort was a good choice though! Hahaha Courtney. I’m sure it was a big hill lol. I usually pack light but that extra baggage allowance seemed a shame to waste! Your driving whoops was a lot better than when my mom took me to New Zealand as a kid. We rented a car and were driving out to boutique hotel owned by a friend of hers. This was back in the dark ages of paper maps so it’s amazing anybody got anywhere. Mom kept insisting that we were going the right way, even though the road kept getting smaller and smaller. Finally, it came to a dead end on a deserted beach. Then (and only then) did mum admit she made a wrong turn. No worries, two hours of backtracking later, we arrived at the proper hotel. I imagine with the cool waters of New Zealand that you wouldn’t need an air conditioner except those few weeks in the end of August when the water warms up and the sea breeze goes stale. I would have never thought to pronounce Whitianga – Fit-ee-enga! I totally would have butchered the name. It sounds like you went at a good time of the year, because it was cool enough to sleep well without air conditioning or a fan. It’s so great that the pool is heated and it looks like a great size. This resort looks great – the kitchen looks fantastic and great to use, especially if you feel like eating in. Lol. I made the mistake a few times lol. It’s a beautiful part of the world Soraya ? I would love to visit New Zealand someday. I have heard so many wonderful things about the beauty found there. It is such a diverse country Debbie with something for everyone. A week was not enough ? Looks like a nice and comfortable place to stay, nothing too complicated. Great location being located right near the beach and only 30 minutes away from other locations. 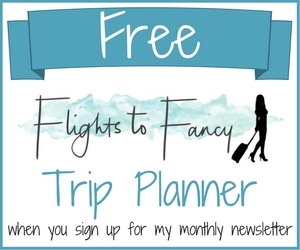 Does the hotel help with booking any tours or activities if you need it? It was perfect for us! I’m not sure if they assist with booking as we had everything sorted when we arrived but they did provide a map of the area and some recommendations on where to eat which was handy! This place looks great! 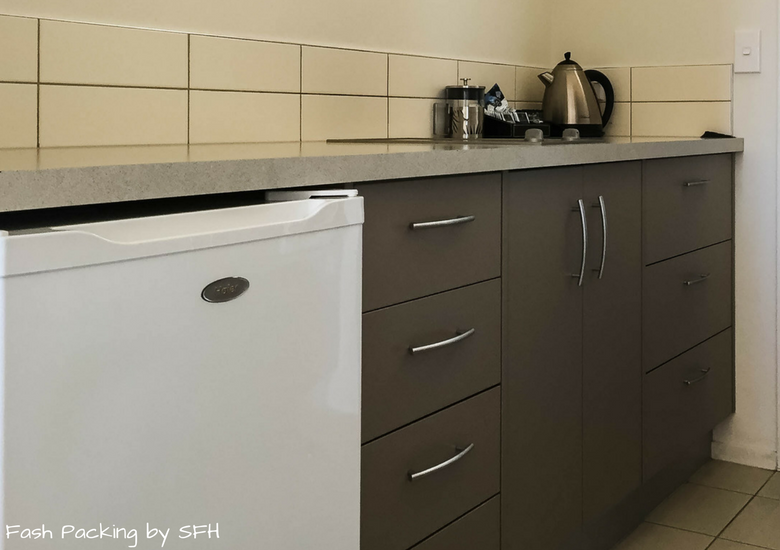 I always prefer to stay in an apartment-type accommodation while I’m away, if only to have a kitchen at my disposal 24/7! Not that I ever use it, I just like the fact that it’s there. The resort looks clean and comfortable and that is one of my ‘must haves’ while booking for an accomodation. After all the sightseeing and exploring you need a good place to rest and relax, the Beachside resort though a bit expensive for the amenities seems to provide exactly that. I’m quite intrigued to know more about the last 2 pictures in the post. Is that the hot water beach? I agree clean and comfortable is key. 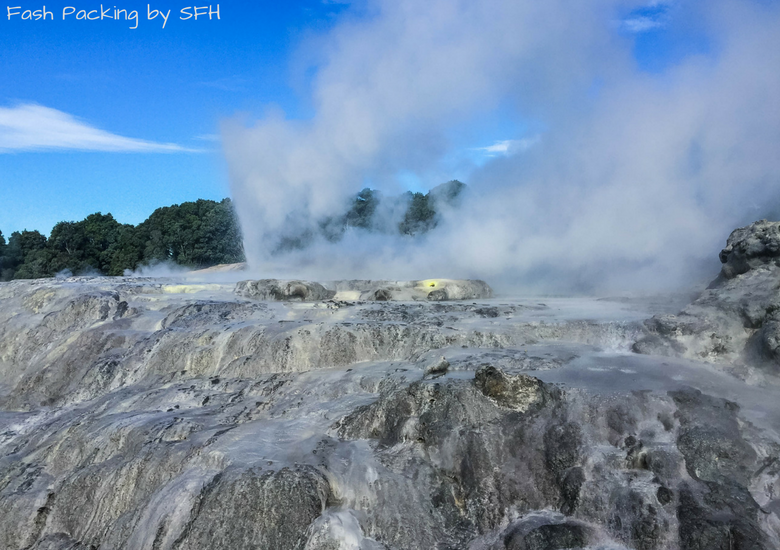 The last two photos are of Te Puia and Skyline Rotorua which are both about three hours away. I’ll have more on Hot Water Beach on the blog shortly! The resort in Whitianga looks like something you’d find is the US when there are no famous chains. It’s a little expensive but I have heard that New Zealand is an expensive place, more so for me after the Brexit. The thin toilet paper sounds a little bit dangerous, lol. If I was staying there I’d eat out at Frankies pub because the hubs recommended it! He needed to refuel after carrying your big bags up the stairs! He’s a good man James. There is a reason I have stayed with him for nearly 25 years and it’s not just cos be carried my bags lol. He tried to get a takeaway from Frankies but they only offer it I tap so no luck there. Yes NZ is expensive to what you would find elsewhere around the globe but compared to the competition Beachside was very competitive. Cool, somewhat retro and simple resort by the beach. I’m all for clean and small places to stay and this one ticks all the boxed including a lovely pool and the fact that it is near the beach. Have also started to enjoy cooking when on holidays so a kitchenette is always welcomed. Agree a kitchen is a welcome bonus. When I travel with a group of friends we always cook but as we were on our own this time it was nice to sample the local restaurants. Agree Fiona. A few simple touches would have elevated this to the next level. Overall we had a very pleasant stay and I would have no hesitation in returning. Seems like an affordable and comfortable place, no-frills to stay. 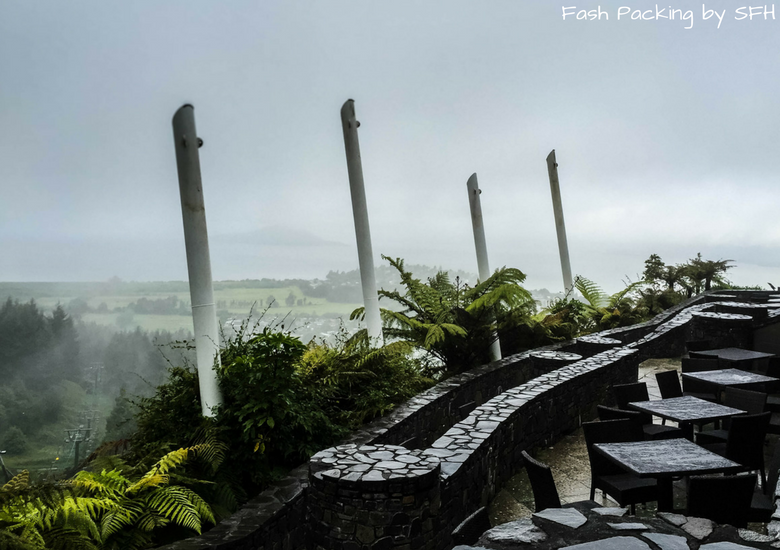 I loved the trips to Rotorua and Waitomo caves…both were very unusual experiences, specially the aborginal dance and glow worms. 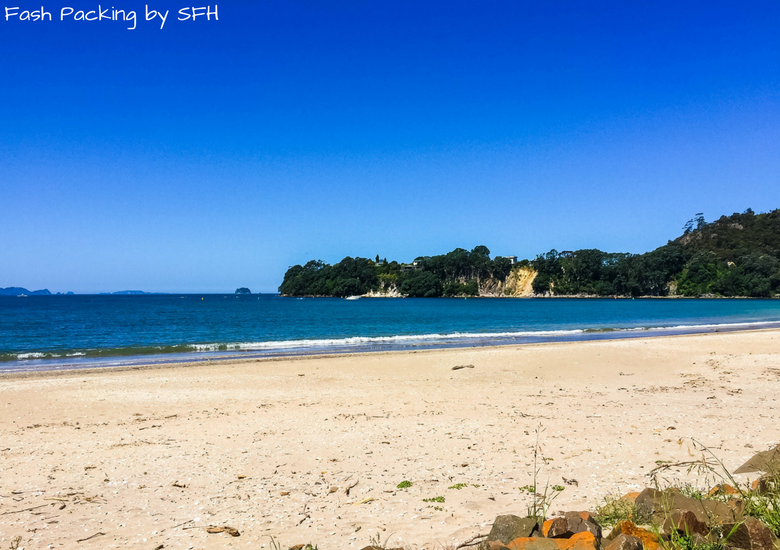 There are so many places you can do within a day trip of Whitianga which makes it the perfect base for a stay in the North Island. 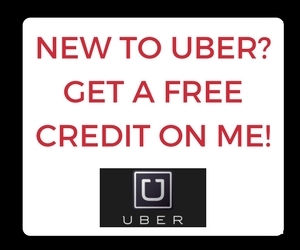 It was very comfortable and I would have no hesitation in staying again. Yes I can see your thinking that it was a little bland but when you compare it to the competition Beachside delivered excellent value and location which was a priority for us.